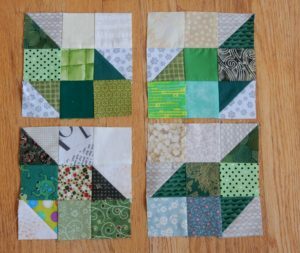 I’ve been following along this year making blocks for my own QAL, but this is the first month I had time to make extras for the lotto. In fact, when I logged into WordPress I see I haven’t entered the lotto since 2013 … I look every month and admire everyone’s creations, but I guess I’ve been busy doing other quilty projects. Here are my two sets of leaves for May. Welcome back, Wendy! I pulled your email and address from the 2013 file … if you are using a different email address or have moved, be sure to let me know so I can update your info.